Marquette, Michigan – April 28th, 2018 – When folks like Stu in Arkansas and Luke in California tell me there’s no other show like American Country Gold in the world, I believe it! If you haven’t discovered my show yet, you don’t know what you’re missing! I’m celebrating 30 years of hosting American Country Gold. In those 30 years, I haven’t missed very many shows. The only reason why I have missed any shows was due to personal reasons. It was nice to finally have a break from the snow this past week. I know my working partner Eric mentioned to me that it’s been difficult for him to keep his driveway clear in Ishpeming this past winter. I hope this upcoming week treats you well! Leave me a message during the work week at 361-WFXD, that’s 361-9393 or you’re always free to email me at elmer@wfxd.com. 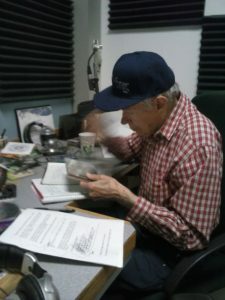 American Country Gold with Elmer Aho on 103-FXD and WFXD.com! Celebrate 30 Years of American Country Gold with Elmer Aho on 103-FXD!